I read the Wall Street Journal‘s tweet on Sunday night about China’s president, seen by Asians and Asian Americans around the world. Is there any question the Wall Street Journal must apologize? And yet by Monday, nothing. No offense intended? But ignorance of audience sensitivities doesn’t excuse the offense. And hiding the evidence by getting rid of the tweet doesn’t make the offense go away either. Just ask all the guys in prison who thought all they had to do was dump a body in the East River. Once you’ve used a silly cliche and crapped on all Chinese people around the world, you can do just one thing. 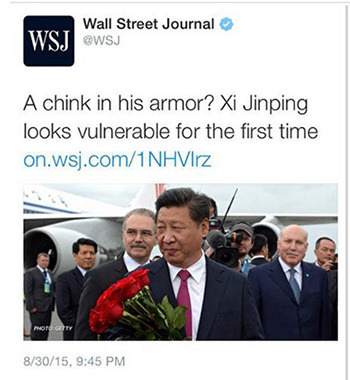 Of course, all bets are off if the story indeed was about Xi Jinping wearing a suit of armor with a funny blemish on his breast plate. A diplomatic faux pas! Especially in August. Or if Xi Jinping were on his way to a joust with Lancelot and Galahad. Then sure, talk about his not-so-shining armor. But that’s not what’s going on here. That literal defense is out. There’s also a literal defense that suggests “chink” refers not to a person, but to some quality or a “weakness” in the character of that person. But where does that leave you when, coincidentally, the subject is an Asian of Chinese descent? It’s the overall weakness of the literal defense. When you take it literally, you end up with a slur, and no one’s laughing. Some will insist we must look only at meaning, otherwise we succumb to censorship. Those who still wish to argue for its use may point to the word “niggardly,” which refers to one’s frugality or cheap nature. It has everything to do with Jack Benny and nothing to do with Jackie Robinson. But the homonym of the base word is usually enough to set off plenty of misunderstanding. Better not to use the word and simply call someone “cheap,” if that’s your intent. Back to journalism. If the purpose is truth and clarity, any word or phrase that might bring about confusion should simply be edited out. And the writer who was trying to have some clever fun must be dealt with appropriately. I thought the modern precedent had been set with ESPN and Jeremy Lin. In the Lin situation, ESPN, the outfit known as the “Worldwide Leader in Sports,” knew exactly what to do, and quickly. It withdrew the copy, fired the writer, and apologized to all concerned. The Wall Street Journal? It’s withdrawn the copy, but that’s all. Or maybe the editors there think, like Donald Trump or Jeb Bush, offending a few Asian and Asian Americans when talking about “anchor babies” and immigration policy is just a matter of political correctness? It’s not about political correctness at all. It’s simply common courtesy and respect for a sense of diversity. Where was the copy editor with the updated diversity style book? People used to get away with saying anything they want about Asians and Asian Americans–even the most offensive things—because we didn’t speak out, or we didn’t care. And then again, there just weren’t enough of us to matter. Well, times have changed. People can’t talk about us like we’re not in the room, because we’re in the audience. We’re subscribers, employees, readers. We’re here. We care. And we matter. And these days, we’ll definitely let you know when you’ve crossed the line. Wall Street Journal, take a note from ESPN.